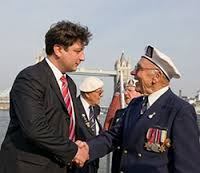 We are grateful for the introduction made by our Patron Admiral The Lord Boyce to the charismatic Founder and Head of VICTORY DAY LONDON Eugene Kasevin. It was for us immediatly clear that we will join forces to support the creation of awareness for this important time in history. Victory Day London is a not-for-profit, privately run project, the concept of which was conceived on May the 1st of 2007 with the sole idea to mark the 9th of May Victory Day in London as it is traditionally celebrated in Russia. The very first event was aimed at the City of London business community and was successfully held on the London Regalia barge that used to be moored on the City side of the Thames west of London Bridge.